After a week of freezing rain, sleet, and snow in the Washington area it is time to turn our thoughts to sunnier times and warmer places. On a recent visit to southern Florida, I had the opportunity to enjoy the antics of the remarkable zebra longwinged butterfly, Heliconius charitonius, as it visited flowering trees and shrubs along a trail through a swampy forest. 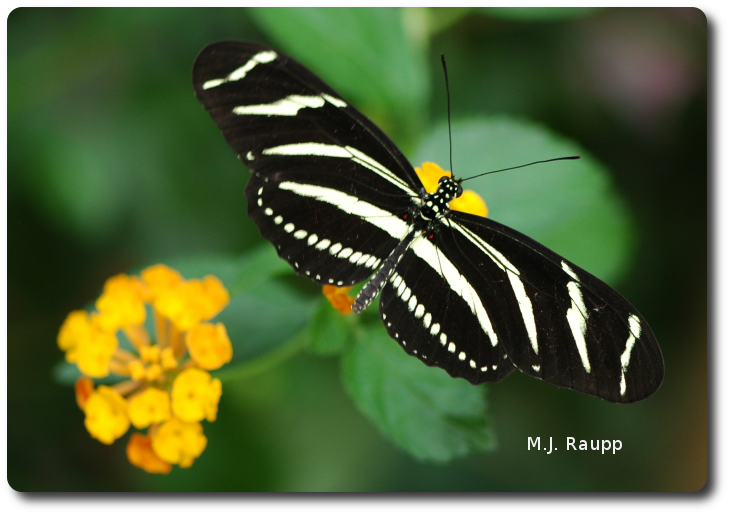 The zebra is member of a group of tropical butterflies in the genus Heliconius, a notable clan of rather long-lived butterflies. These beauties live up to six months. Zebras and their kin evolved an interesting strategy to gather nutritious pollen used to sustain their long lives. The zebra flies a well-defined route through the forest visiting flowers that present a fresh batch of pollen each day. This behavior is called traplining and is employed by many tropical pollinators including bees, hummingbirds, and bats. After collecting a gob of pollen on its long, straw-like proboscis, the butterfly secretes specialized enzymes to release the amino acids and other nutrients in the pollen. The nutrients are absorbed through the membranes lining the proboscis and used by the butterfly to produce eggs and maintain its high level of activity zooming about the forest. In addition to visiting flowers laden with pollen, the zebra also searches for different species of plants in the passion-vine genus, Passiflora. 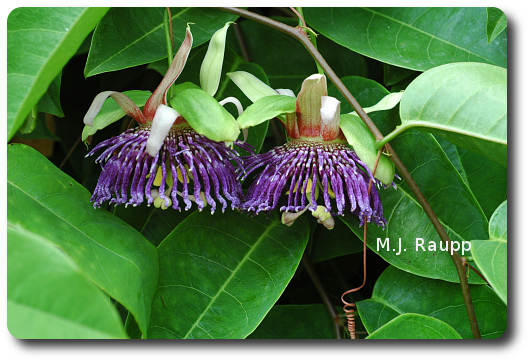 These tropical vines bear the magnificent passionflower. Several species of passion-vine are used by the immature stages of the zebra and other Heliconius butterflies as a source of food. These larvae are voracious caterpillars and consume great quantities of leafy tissue on a daily basis. While several types of toxic compounds chemically defend Passiflora plants, the highly specialized larvae of the zebra butterfly and several closely related species have overcome these defenses and now consume leaves of the passion-vines with impunity. With so much leaf-munching by the larvae of the zebras and their kin, one wonders how the vines of Passiflora survive. It seems that the mobile and eagle-eyed Heliconius butterflies locate passion-vine plants by the shape of their leaves. To fool these clever herbivores, tropical passion-vines have evolved leaves that vary dramatically in shape. In this way it is more difficult for butterflies to zero in on any one leaf shape as they search for food for their young. At least one species of Passiflora has taken this game of deception one step further. It has evolved a small structure on the tips of its leaves resembling the egg of a Heliconius butterfly. Larvae of Heliconius are known to be cannibalistic and female butterflies may avoid placing eggs on a leaf if it is already occupied by another caterpillar or by an egg about to hatch. By creating a structure that resembles an egg, the passion-vine hangs a sign that says “no vacancy” to the female butterfly looking for a spot to lay eggs. This remarkable act of mimicry helps the passion- vine escape the ravages of very hungry caterpillars. References used in the preparation of this Bug of the Week include "Caterpillars of Eastern North America" by David L. Wagner; "Butterflies East of the Great Plains" by Paul Opler and George Krizek; and "Coevolution of Animals and Plants" by Lawrence Gilbert and Peter Raven.